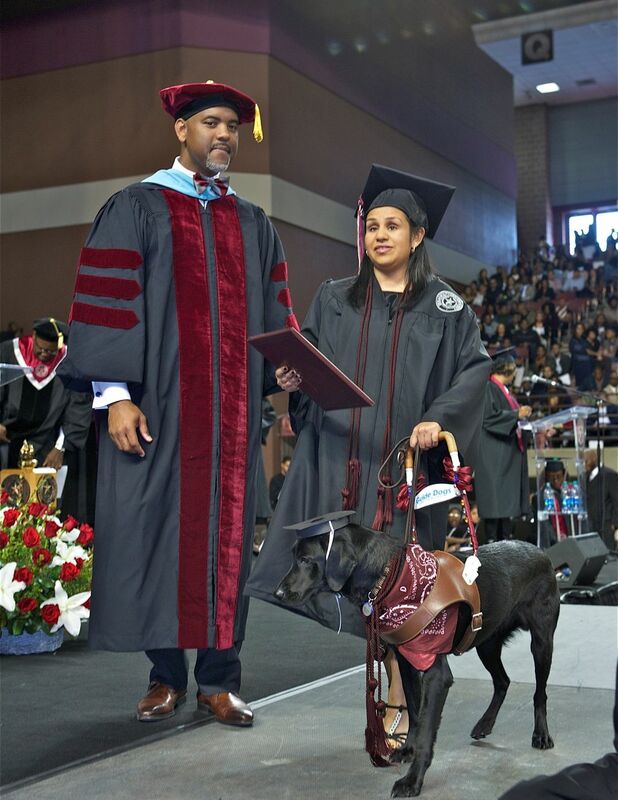 Austin Lane, president of Texas Southern University, awards a business degree to Ana Gabriela Cepeda Morales as she fulfills her dream of walking across the stage to accept her diploma with Calliope, her service dog. 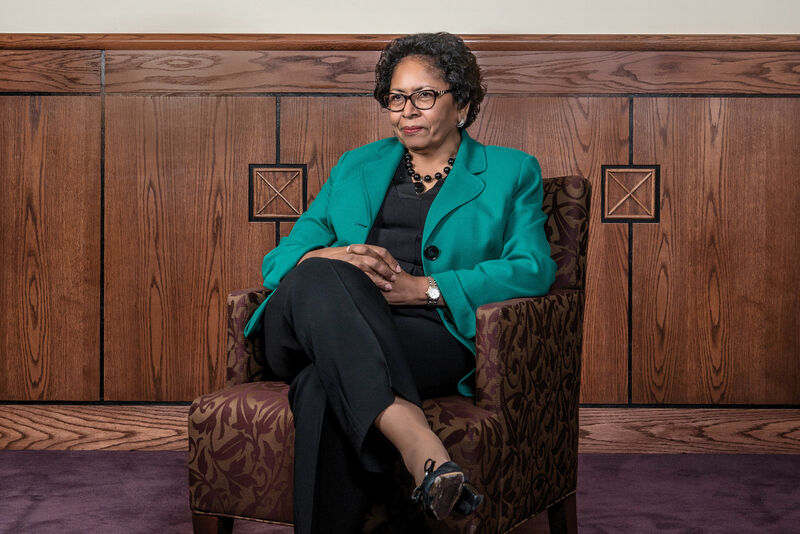 June 6 marked the anniversary of Dr. Austin Lane’s first year as president of Texas Southern University. With a year under his belt, Lane remains confident about the university’s future, while acknowledging some serious challenges: an unclear path forward for higher-education funding at the state level, and a federal budget proposal that poses a threat to student aid programs. Lane was in the news back in February, when he was among a group of HBCU (historically black college or university) leaders in attendance at the White House for what was known as the “HBCU Fly-in.” The group faced criticism from the HBCU community for meeting with President Donald Trump and his administration, which had signaled it might try to end certain federal programs that provide financial assistance to historically black colleges and universities; some even called the meeting nothing more than a “photo-op” between the President and black leaders. The purpose of the HBCU Fly-in was less about meeting the president, he says, and more about speaking with his cabinet, giving HBCU leaders an opportunity to voice their requests and concerns to the new administration. The main items on the table for discussion? The reinstatement of year-round Pell grants and an increase in Title III funds. 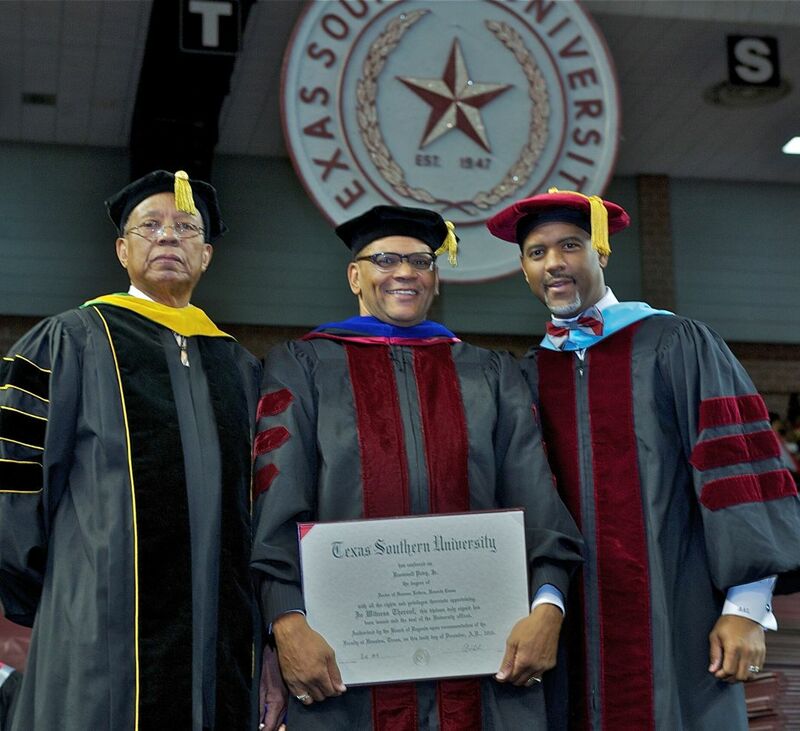 Lane, right, at TSU's December 2016 graduation ceremony alongside Port Arthur businessman Roosevelt Petry, center, who was presented with the university’s Doctorate of Humane Letters, and Dr. Bobby Wilson, left, Interim Provost and Vice President for Research. President Trump delivered his proposed federal budget plan in May, with plans to greatly reduce student aid and loan programs while cutting funding for university-based research. Although the budget does include reinstating Pell grants, it significantly reduces their funding, eradicating aid that is crucial for some students, especially at universities such as Lane's: During the 2015-2016 school year, 94 percent of TSU’s full-time first-year students received some form of financial aid and 77 percent received aid through Pell grants. 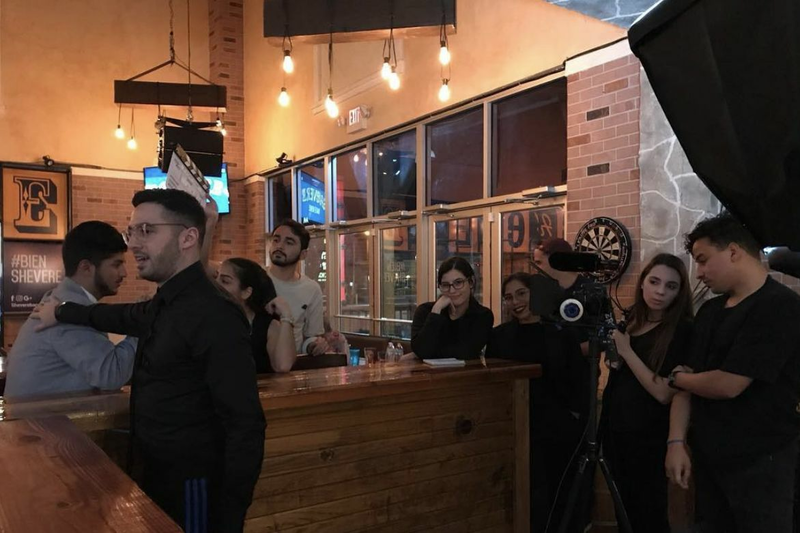 Meanwhile, in June, Texas Governor Greg Abbott signed the state’s budget bill, which mostly avoided a much-discussed overhaul of the way Texas universities are funded—the state legislature ultimately rejected austere cuts to higher-education funding, to the great relief of Lane and his colleagues. “I would say we dodged a bullet,” Lane says, though he's already anticipating budget plans for the next biennium, where he hopes to see legislation that focuses on facilitating student transfers and preserving the practice of "special items," a budgeting tactic by which universities and colleges seek money for specific projects outside of standard funding formulas. In the 2011 fiscal year, about 15 percent of TSU’s direct state support was the result of special items; these went to programs for leadership development, continuing school accreditation, and retention rates. The state Senate proposed removing all special items such as these from universities across Texas, which together total about $1 billion, a change that higher-education advocates hold would have dire consequences for independent institutions like TSU that rely heavily on special items to finance academic programs. In regards to facilitating student transfers, currently, TSU has a deal with the Lone Star College system that provides opportunities for students to enroll in the university, but Lane envisions a future with a “seamless pipeline” for students to transfer from community colleges to four-year institutions. 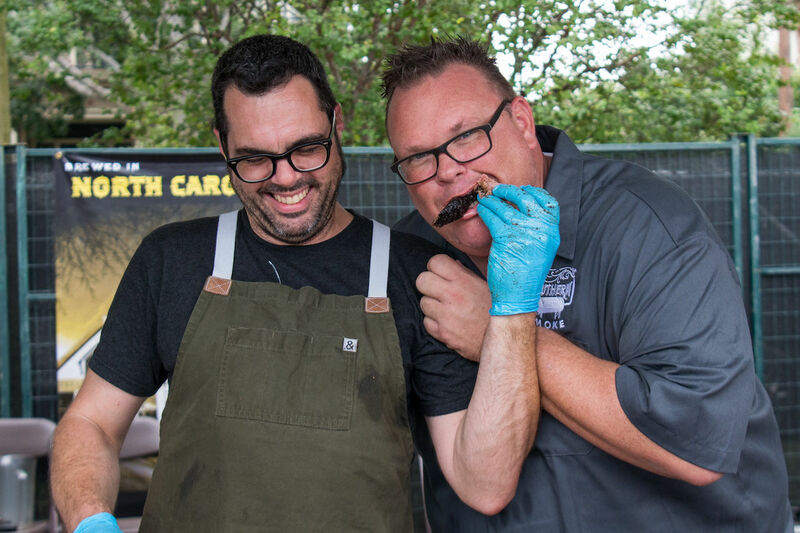 "Over the last year, we’ve been focused on really five things: one being student success and completion, two being academic-program quality and research, three is our culture, four is our partnerships, and five is our finances," says Lane. "And so everything we do, or continue to do, has to be tied to one of those five areas where we’re showing signs of progress and success."